WE HAVE ALL BEEN CAPTIVATED BY THE stunning political stories that have erupted in our country lately. 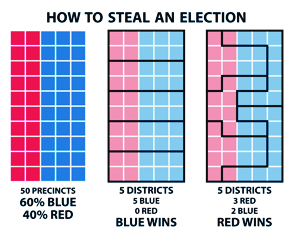 Walls, immigration bans, the return of white supremacy groups and more have distracted us from a quiet power grab that has been taking place behind the scenes: Gerrymandering. It is a slight-of-hand that has been executed masterfully by political groups to advance their own agenda. Voters should choose their politicians; not the other way around. But some of our most important borders in Michigan and other states have been drawn up by politicians to serve their own political agendas, looping the power of the people out of decisions regarding their future. Our Founding Fathers would be appalled with gerrymandering. Gerrymandering is a process by which the party in power, either Democrat or Republican, redraws voting districts to benefit their own party and weaken their opponent. Because of gerrymandering, fewer and few-er Congressional districts, for example, are competitive anymore. The incumbent is sure to be reelected, giving people little reason to even bother voting. 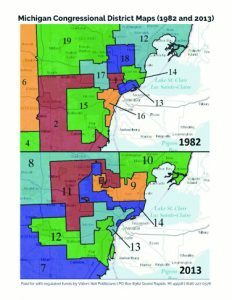 Gerrymandering manipulates political boundaries that divide our neighborhoods and communities, essentially removing voters’ ability to impact a political election. This unfair but legal tactic is used in every state by both Republicans and Democrats in order to sequester enough votes to win elections no matter what the majority of the voters want. Forms of gerrymandering go back to as early as 1788. But everything changed in 2010. In 2009, Republican strategists took advantage of the fact that 2010 was a census year as well as a midterm election year. State leaders – based on those census results – redesigned voting districts to benefit the GOP for the next 10 years. The 2010 election outcomes of 2010 show the strategy was wildly successful. Republicans gained almost 700 seats at the state level across the U.S. This wiped out Democratic advantages in Alabama, New York, Michigan, Ohio, Pennsylvania and Wisconsin. Republicans were then firmly in charge of redistricting. 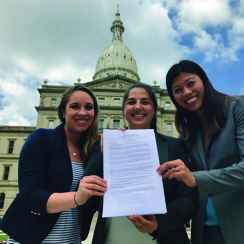 IN MICHIGAN, THE GRASSROOTS STARTUP ORGANIZATION, VOTERS NOT POLITICIANS, is transparent process for drawing fair electoral district boundaries that will result in fair and competitive elections. The plan is to reform the process by amending the Michigan Constitution through a ballot initiative in the November 2018 election. Katie Fahey is the President of Voters Not Politicians, which has snowballed into a large network of people across Michigan following the 2016 elections. She began by holding 33 town meetings to discuss and survey voters to find out what they really want. “It is breathtaking to see how many people want to come together in these divisive times,” Katie shared. Voters Not Politicians needs 315,654 valid petition signatures by February 2018 for the ballot initiative to succeed. As of September, they had collected over 140,000 votes, and 100,000 of those came in 25 days. They already have signatures from all 83 counties in Michigan. Because of their success, it isn’t surprising that they have become a threat and a target to the status quo and establishment politicians. One such opponent is Michigan Republican attorney Bob LaBrant, who filed a complaint against the Voters Not Politicians commit-tee this past Summer. LaBrant advises clients on political strategy, and is recognized as one of Michigan’s foremost experts on campaign finance law and redistricting. MICHIGAN IS ONE OF 37 STATES that gives all power for deciding voting district boundaries to the state legislature. In order for proposed maps to pass muster, a simple majority of each chamber of the state legislature must vote yes. The governor has the power to veto the redistricting plan. However, when one party controls each of these areas, they effectively have full control over the redistricting process with zero input from other parties, and of course, no input from the people who elected them in the first place. When the legislature draws the election maps, they get to choose their voters, instead of voters choosing them. This is direct manipulation of election outcomes and allows politicians to give their party an advantage sometimes for decades to come. The evolution and use of advanced computer software and big data has empowered this type of manipulation and contributed to the extreme partisan gerrymandering that we see in states like Michigan. Skillful redistricting can grace incumbents with virtually guaranteed reelection or leave them with no chance at all. LARGE AMOUNTS OF “DARK MONEY” (legaly undisclosed political contributions) flooding into politics has also led to the severe manipulation of voting maps. Lobbyists and special interests invest enormous sums of money to fund highly complex and corrupt redistricting plans to keep politicians they control in power. This influences politicians to follow the will of who is pa-ing them instead of the will of the people. The names of the groups that are bankrolled by corporations, unions and other special interests sound very dedicated to democracy and America. Names like “Fair Districts Mass” and “Protect Your Vote” and “The Center for a Better New Jersey.” But a deep-dive investigation by ProPublica (an independent, nonprofit newsroom that produces investigative journalism with moral force.) found that while these groups purport to help represent voters in their communities, their main interest is gaining a political advantage in the fight over redistricting. Powerful players are turning to increasingly sophisticated tools and techniques to “game” the redistricting process, while voters are almost all blind to their shenanigans, and ultimately losing. Corporations and outside interests provide cash for voter data, mapping consultants and lobbyists to influence state legislators who are in charge of redistricting. They can also fund the inevitable lawsuits that contest nearly every state’s redistricting plan after it is unveiled. CRACKING: If a party feels threatened by high densities of voters that fall into certain demographics or political ideologies, they crack them apart to dissipate and destroy their voting power. PACKING: Politicians can also “pack voters” from the other party into a few districts. While this gives the other party a couple districts, it maintains power in all the other districts because the opposing party’s voters have been herded so tightly into just a few districts. KIDNAPPING: Michigan representatives must live in the district they represent. District lines can be drawn so precisely by the opponent party that they can remove an incumbent politician from their home district. This strategy is used when an incumbent with a solid home-base is targeted and the lines drawn to move them to a neighboring district. This gives the majority party the power to silence their influence in the next election. HIJACKING: Hijacking occurs when a political candidate is packed into a district with an established leader of the same party. This forces the two to run against each other in the primary election and removes them from competing with the other party in neighboring districts. If we continue to allow politicians the power to control the redistricting process, we risk letting one of the two parties manipulate our election maps in 2020, when the next census is conduct-ed. Both parties are preparing to continue the tradition of partisan gerrymandering and have very distinct and aggressive strategies in place to secure voting districts: the Republicans are preparing a project called REDMAP 2020 and the Democrats are preparing their own project named ADVANTAGE 2020. Politicians don’t want us to take away their control of the election maps because it helps them stay in power, even if the general public wants them out. If gerrymandering in Michigan continues, the ones who benefit are the members of the state legislature and their armies of lobbyists. “The people of Michigan have been locked out of effective change-making opportunities, but we have the power, energy, and drive to create a solution that ends gerrymandering and reinvigorates the very spirit of our democracy,” emphasizes Katie Fahey. Voters Not Politicians is a major grassroots effort to thwart the gerrymandering plans of politicians, and they need your signature.